This autumn brings the first sentimental comedy in a while which has touched my heart as much as THE HOLIDAY did in 2006, which was funnily enough also written and directed by Nancy Meyers. 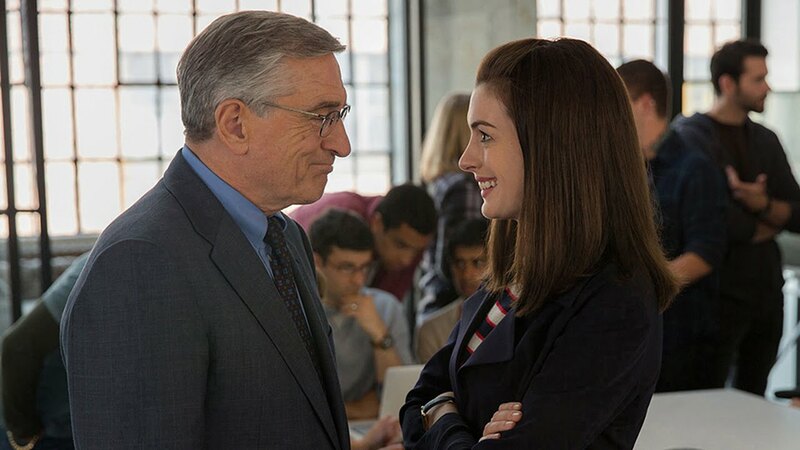 There is something about adorable elderly people in films which resonates with a viewer so much, and the fact that in THE INTERN that elderly person is none other than the Hollywood legend Robert De Niro, it makes the two hour experience extra special. De Niro plays 70-year-old widower Ben Whittaker, who puts his grieving and retirement behind him when he sees an advertisement for senior internships at an online fashion site. Whittaker works as a personal assistant to the company’s hard-working founder Jules Ostin (Anne Hathaway) who struggles to find the balance between keeping her company a success and being there for her stay-at-home husband and daughter. Determined to not only make an impact, but help other people on a daily basis Whittaker becomes the office uncle, helping Jules and her co-workers through daily struggles and forming a beautiful friendship with the initially reserved and quiet founder. This film is an October watch which will have you grinning from ear to ear throughout. De Niro keeps the “dying breed” of 20th century gentleman alive with his mesmerising collection of suits and ties, his 1970s briefcase and the handkerchiefs to cure all women’s problems, and is as adorable as he is cool in this feature. The constant age barrier jokes are brilliant between Whittaker and his colleagues, and his father-figure relationship with Jules is one of the most heart-warming things I have seen on screen this year. Hathaway, as always, is brilliant in her role. She plays the 21st century, bread-winner businesswoman perfectly, and highlights the struggles which are sometimes created in the household as a result of this dedication to her company. Jules’ story is uplifting and heart-breaking at times, and Hathaway has to also be applauded for the levels of emotion throughout this film. Overall, THE INTERN is a beautiful and refreshing comedy drama which brings a concoction of emotions which I was not ready for on a Sunday afternoon, but has been needed on the screen for a while to remind us that it is not all about the action blockbusters and Oscar-nominated dramas which make cinema brilliant. Recommendation: A lovely light-hearted comedy with a touch of drama which will make for any great date night or sentimental watch. Well worth the cinema ticket and a brilliant performance from two powerhouses in Hollywood.